Please call 1 (800) 791-6819 if you have questions. Experience. 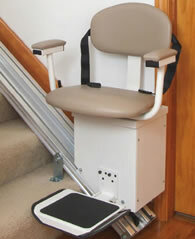 We have been providing advice and selling stair lifts since 2002 and despite the down economy we are still going strong. During those years we've sold stair lifts for nearly every application imaginable. We know the ins and outs of stair lift chairs, each model's little quirks, and what to tell you to expect when installing a stair lift. We know who to call if something does go wrong and we have good relationships with the manufacturers (we are authorized dealers of every product we sell) so you can get warranty service without a hitch. Low Prices. We offer the lowest prices. It's as simple as that. What's more we can offer the lowest prices without going out of business, so you can count on us being there for you when you need our services next. We even offer used stair lifts at extremely low prices for the budget-conscious shopper, so anyone can get a stair lift at the price that they can afford! Commitment to Customer Satisfaction. Whether you are looking to purchase now, in the next year, or just want our recommendations, we are going to listen to you and provide you with our best advice. And if you need someone to explain stair lifts from the very start, we are happy to do that for you, too. Once you've purchased from us you become our client. We won't forget about you and any problems you may have become opportunities for us to help. We will help you!